What happened to Azure Machine Learning Workbench? The Azure Machine Learning Workbench application and some other early features were deprecated and replaced in the September 2018 release to make way for an improved architecture. To improve your experience, the release contains many significant updates prompted by customer feedback. The core functionality from experiment runs to model deployment hasn't changed. But now, you can use the robust SDK and the Azure CLI to accomplish your machine learning tasks and pipelines. Most of the artifacts that were created in the earlier version of Azure Machine Learning service are stored in your own local or cloud storage. These artifacts won't ever disappear. In this article, you learn about what changed and how it affects your pre-existing work with the Azure Machine Learning Workbench and its APIs. This article is not for Azure Machine Learning Studio users. It is for Azure Machine Learning service customers who have installed the Workbench (preview) application and/or have experimentation and model management preview accounts. A simplified Azure resources model. A new portal UI to manage your experiments and compute targets. A new, more comprehensive Python SDK. The new expanded Azure CLI extension for machine learning. The architecture was redesigned for ease of use. Instead of multiple Azure resources and accounts, you only need an Azure Machine Learning service Workspace. You can create workspaces quickly in the [Azure portal]((setup-create-workspace.md#portal). By using a workspace, multiple users can store training and deployment compute targets, model experiments, Docker images, deployed models, and so on. Although there are new improved CLI and SDK clients in the current release, the desktop workbench application itself has been retired. Experiments can be managed in the workspace dashboard in Azure portal. Use the dashboard to get your experiment history, manage the compute targets attached to your workspace, manage your models and Docker images, and even deploy web services. On January 9th, 2019 support for Machine Learning Workbench, Azure Machine Learning Experimentation and Model Management accounts, and their associated SDK and CLI has ended. All the latest capabilities are available by using this SDK, the CLI, and the portal. Older run histories are no longer accessible, how you can still see your runs in the latest version. Run histories are now called experiments. 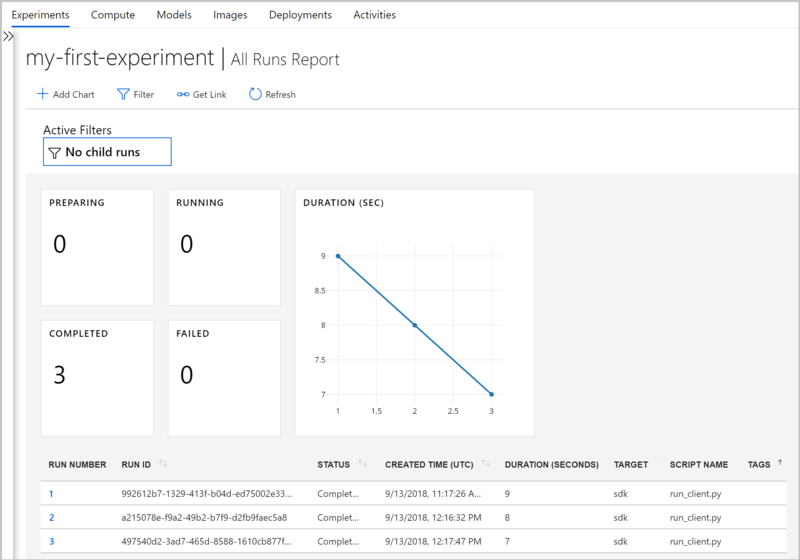 You can collect your model's experiments and explore them by using the SDK, the CLI, or the Azure portal. Start training your models and tracking the run histories using the new CLI and SDK. You can learn how with the Tutorial: train models with Azure Machine Learning service. Can I still prep data? Your pre-existing data preparation files aren't portable to the latest release because we don't have Machine Learning Workbench anymore. But you can still prepare any size data set for modeling. With data sets of any size, you can use the Azure Machine Learning Data Prep SDK to quickly prepare your data prior to modeling by writing Python code. You can follow this tutorial to learn more about how to use Azure Machine Learning Data Prep SDK. You won't lose any code or work. In the older version, projects are cloud entities with a local directory. In the latest version, you attach local directories to the Azure Machine Learning service Workspace by using a local config file. See a diagram of the latest architecture. Create a workspace to get started. What about my registered models and images? The models that you registered in your old model registry must be migrated to your new workspace if you want to continue to use them. To migrate your models, download the models and re-register them in your new workspace. The images that you created in your old image registry must be re-created in the new workspace to continue to use them. You can re-create these images by following the Configure and create image sections. What about deployed web services? Now that support for the old CLI has ended, you can no longer redeploy models or manage the web services you originally deployed with your Model Management account. However, those web services will continue to work for as long as Azure Container Service (ACS) is still supported. In the latest version, models are deployed as web services to Azure Container Instances (ACI) or Azure Kubernetes Service (AKS) clusters. You can also deploy to FPGAs and to Azure IoT Edge. What about the old SDK and CLI? Yes, they'll continue to work until January. See the preceding timeline. We recommend that you start creating your new experiments and models with the latest SDK or CLI. By using the new Python SDK in the latest release, you can interact with Azure Machine Learning service in any Python environment. Learn how to install the latest SDK. You can also use the updated Azure Machine Learning CLI extension with the rich set of az ml commands to interact with the service in any command-line environment, including Azure Cloud Shell. What about Visual Studio Code Tools for AI? In this latest release, the extension was renamed to Azure Machine Learning for Visual Studio Code and has been expanded and improved to work with the preceding new features. The domain packages for computer vision, text analytics, and forecasting can't be used with the latest version of Azure Machine Learning. However, you can still build and train computer vision, text, and forecasting models with the latest Azure Machine Learning Python SDK. To learn how to migrate pre-existing models built by using the computer vision, text analytics, and forecasting packages, contact AML-Packages@microsoft.com. Learn about the latest architecture for Azure Machine Learning service. For an overview of the service, read What is Azure Machine Learning service? For a quickstart showing you how to run a script, and explore the run history of the script with the latest version of Azure Machine Learning service, try get started with Azure Machine Learning service. For a more in-depth experience of this workflow, follow the full-length tutorial that contains detailed steps for training and deploying models with Azure Machine Learning service.